Accompanied by the girls from SotonBloggers, we arrived just after 7pm to a champagne reception. After canapes and champagne, we were shown to the Atrium and slowly made our way to our seats for the meal. 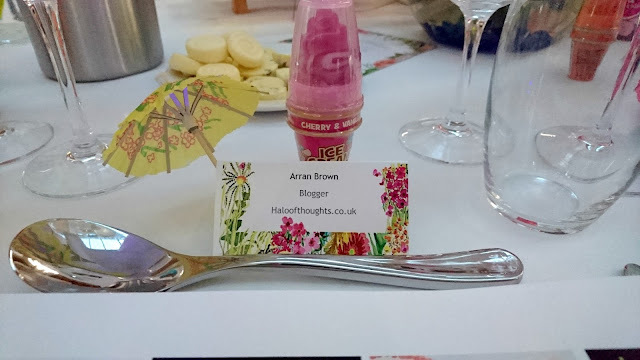 We were seated at the Buttercup table, the theme for the evening was Summer Garden Party so the decorations were made up of florals and greens. Our table was set with place settings so after locating my seat and served wine, we all started on the first course. 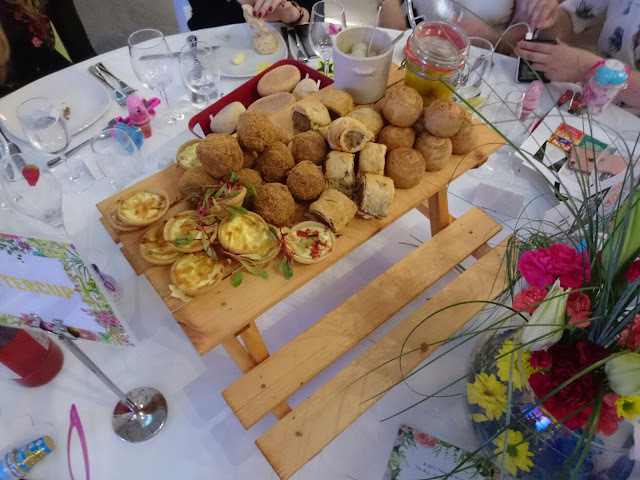 The first course was laid out on a mini picnic bench covered with mini quiche, sausage rolls, scotch eggs and pork pies, all provided by The Artisan located in Guildhall Square. Our main was a chicken salad followed by a summer berry mousse. 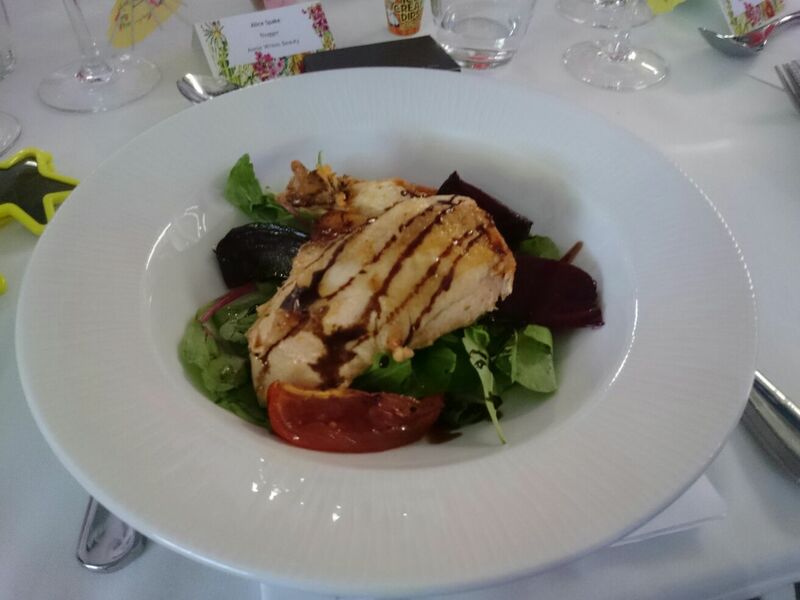 The food was great and perfectly in keeping with the theme of the evening. After we finished our meals, the raffle was held. We were each given a raffle ticket inside our place settings with Tanya being the only winner from our table. After the raffle we explored the conference centre. Lots of different rooms were set up differently to showcase what could be done. 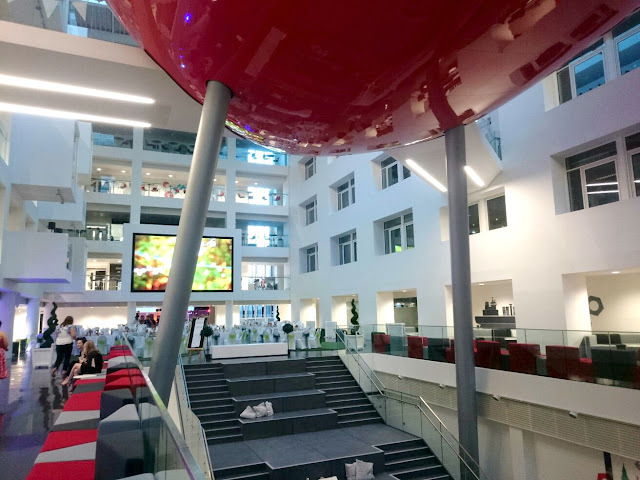 The Pod, which is the main focal point provided the perfect space as a photo booth for the evening. There was live music playing throughout the evening while we walked around to see what we could find. Face painting and balloon animals were being done in the room showing their Christmas table set up and packages while just outside was a pick'n'mix cart which resulted in a few bags being filled full of sweets to satisfy my sweet tooth. There was also a cake station displaying Love Bakery's incredible creations and a prohibition bar where you had to guess the password to gain entry! I really enjoyed my first blog event and spent the evening with some great people. Really looking forward to my next event! Great post! I think you had a great time that evening. The food is just looking delicious. Recently I too attended conference center party at one of NYC venues with my friends. It was amazing as we discover many things there.